Drake alumna Kelsi Ziemann is founder of Kelsi Ziemann Artistry. The cosmetics company was one of three ventures to earn top honors during the 2016 Pappajohn Student Entrepreneurial Venture Competition. 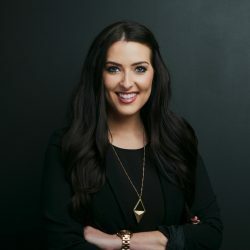 Drake University alumna Kelsi Ziemann recently was honored as one of the state’s top young entrepreneurs during the John Pappajohn Student Entrepeneurial Venture Competition. Kelsi Ziemann Artistry was one of three student ventures selected to receive a $5,000 prize. Philanthropist John Pappajohn and Equity Dynamics, Inc., announced the winners during the annual competition’s awards ceremony on April 22. Ziemann graduated from Drake in December 2015 with degrees in marketing and entrepreneurship. The Van Meter, Iowa, native formed Kelsi Ziemann Artistry earlier that year as a professional service-based cosmetics company offering on-location makeovers. She refined her venture through participation in Drake’s Lorentzen Student Hatchery, which provides financial and mentorship support to students who pursue business and nonprofit ventures while still in school. After thousands of customer requests for a long-wearing lipstick and lip liner in coordinating colors, KZA is in the final stages of developing a patented lipstick and lip liner kit that makes it easier for customers to shop for and store lip products. The company plans to donate a percentage of sales to empower women through educational scholarships. Last year when Ziemann entered Pappajohn’s student venture competition, she finished as a regional finalist, earning herself a $500 prize. This year she says judges were impressed by how much tangible progress she’d made in developing her product and her brand, particularly because she’s operating within the highly competitive cosmetics industry. Ziemann says she owes a lot of that progress to the skills and connections she made at Drake. She decided to become a Bulldog after completing her associate’s degree at DMACC. Drake had a stronger reputation than other schools she looked at in central Iowa and, after receiving strong financial aid package that included scholarships for academic merit, the cost was comparable to Iowa State University. Drake seniors Shelby Daum and Danielle Fulkerson, both of whom are marketing and entrepreneurship majors, and Jennifer Gardner, a magazines major with minors in marketing and entrepreneurship, supported the project. Gardner continues to provide social media services to KZA. This year’s other John Pappajohn Student Entrepeneurial Venture Competition award winners were SwineTech, a farrowing monitoring systems company located in New Sharon, Iowa, and operated by Matthew Rooda and Abraham Espinoza of the University of Iowa; and VIM, owned by Kevin O’Rourke of the University of Northern Iowa, which produces a hardware device that attaches to weightlifting equipment.